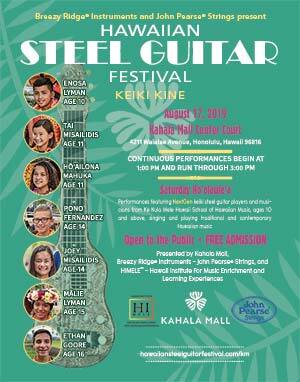 The Hawaiian Steel Guitar Festival at Kahala Mall Keiki Kine will feature several keiki steel guitar players and musicians from Ke Kula Mele School of Hawaiian Music. These NextGen players range in age from 10 years old and above. Performance times are tentative. "NextGen" steel guitarists and musicians of Ke Kula Mele Hawaii School of Hawaiian Music will perform for festival attendees' enjoyment. The Festival Archives will contain program information from previous Kahala Mall festivals.